Normally our patients spend two-hours-a-day, five-days-a-week, in our IV Therapy room. This allows much of the day for enjoying our beautiful beaches with other patients and families. We encourage patients to exercise by walking barefoot on the soft sugar sand for a natural foot massage and calming aerobic activity. Our winters offer sunny dry weather, which is a perfect environment for healing. We Treat patients from all over the world. Canadian and European patients comment that Clearwater Beach is one of the most beautiful beaches they have experienced. The white “sugar sand” at Clearwater Beach is just 14 miles from Sponaugle Wellness Institute. In February 2016, TripAdvisor named Clearwater Beach as the #1 beach in the U.S., and #20 worldwide, as part of its Travelers’ Choice Awards! “Honored for its 2.5 miles of “powdery sand and calm, shallow water,” Clearwater Beach is listed as a great vacation spot for its pedestrian-friendly Beach Walk Promenade and lively scene at Pier 60. According to TripAdvisor, Clearwater Beach “has it all” with a mix of beach scenes, water sports, restaurants and hotels.” – TampaBay.com (read the entire story). Caladesi Island is a beautiful island located just eight miles from Sponaugle Wellness Institute. The close proximity of Caladesi makes it a great day trip for patients and families. A Florida State Park, Caladesi has been protected from commercialization and maintains a clean all natural ambiance. Dr. Beach suggests that Caladesi is one of the most pristine beaches in America. Dr. Sponaugle agrees and prefers the quiescence of Caladesi Island over the more commercialized Clearwater Beach. Beach lovers can enjoy swimming, sunbathing and beach combing. Saltwater anglers can cast a line from the beach. Nature enthusiasts can spot wildlife while hiking the three mile nature trail through the island’s interior or paddling a three mile kayak trail through the mangroves and bay. Picnic tables and shelters are located near the beach. The park has a snack bar and gift shop. 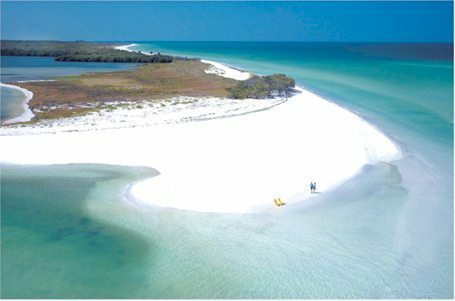 Caladesi Island is accessible via 20 minute ferry ride from Honeymoon Island State Park, which is an eight-mile drive from Sponaugle Wellness Institute. Ferry service is provided by the Caladesi Island Ferry (727) 734-1501. Kayak and Wind Surfing rentals are available at Honey Moon Island.